On behalf of the Board of Directors of Global Brass and Copper Holdings, Inc. (the “Company”), you are cordially invited to attend the 2019 Annual Meeting of Stockholders (the “Annual Meeting”) to be held on May 23, 2019, at 10:00 a.m. (Central Time) at The Woodfield Corporate Center, 425 N. Martingale Road, Suite 90, Schaumburg, Illinois 60173. We have included in this letter a proxy statement that provides you with detailed information about the Annual Meeting. We encourage you to read the entire proxy statement carefully. You may also obtain more information about the Company from documents we have filed with the United States Securities and Exchange Commission. You are being asked at the Annual Meeting to (i) elect the director nominees named in this proxy statement, (ii) to ratify the appointment of PricewaterhouseCoopers LLP as our independent registered public accounting firm for 2019, (iii) to approve, on an advisory basis, the compensation of our named executive officers, and (iv) to transact any other business properly brought before the meeting. Whether or not you plan to attend the Annual Meeting, your vote is important and your prompt consideration is appreciated. You may vote your shares through one of the methods described in the enclosed proxy statement. We urge you to read the accompanying proxy statement carefully and to vote FOR the nominees proposed by the Board of Directors and in accordance with the recommendations of the Board of Directors on the other proposals by following the voting instructions contained in the proxy statement. On behalf of the Board of Directors, I thank you in advance for your continued support of Global Brass and Copper Holdings, Inc. This proxy statement is dated March 29, 2019 and is first being distributed to stockholders on or about March 29, 2019. 4. conduct any other business properly brought before the meeting or any adjournments or postponements thereof. Voting is limited to stockholders of record at the close of business on March 25, 2019. A list of stockholders entitled to vote at the meeting, and any postponements or adjournments of the meeting, will be available for examination between the hours of 9:00 a.m. and 5:00 p.m. (Central Time) at our headquarters at 475 N. Martingale Road, Suite 1050, Schaumburg, Illinois 60173 during the ten (10) days prior to the Annual Meeting and also at the Annual Meeting. YOUR VOTE IS IMPORTANT. WHETHER OR NOT YOU PLAN TO ATTEND THE ANNUAL MEETING, PLEASE VOTE YOUR SHARES OVER THE TELEPHONE OR VIA THE INTERNET OR BY COMPLETING, DATING, SIGNING AND RETURNING A PROXY CARD, AS DESCRIBED IN THE ENCLOSED PROXY STATEMENT. YOUR PROMPT COOPERATION IS GREATLY APPRECIATED. As permitted by rules adopted by the United States Securities and Exchange Commission (the “SEC”), we are making this proxy statement and our annual report available to stockholders electronically via the Internet. On or about March 29, 2019, we will mail to most of our stockholders a notice (the “Notice”) containing instructions on how to access this proxy statement and our annual report and how to vote via the Internet, by telephone or by mail. Other stockholders, in accordance with their prior requests, will receive e-mail notification of how to access our proxy materials and how to vote via the Internet or by telephone, or will be mailed paper copies of our proxy materials and a proxy card on or about March 29, 2019. The Notice also contains instructions on how to request a printed copy of the proxy materials. In addition, you may elect to receive future proxy materials in printed form by mail or electronically by e-mail by following the instructions included in the Notice. If you have previously elected to receive our proxy materials electronically, you will continue to receive these materials via e-mail, unless you elect otherwise. This proxy statement contains information related to our 2019 Annual Meeting of Stockholders (the “Annual Meeting”) of Global Brass and Copper Holdings, Inc. (referred to herein as the “Company,” “GBC,” “we,” “us” or “our,” as the context requires) to be held at The Woodfield Corporate Center, 425 N. Martingale Road, Suite 90, Schaumburg, Illinois 60173, on May 23, 2019, at 10:00 a.m. (Central Time). This proxy statement is first being distributed to stockholders on or about March 29, 2019. We sent you this proxy statement because the Board of Directors (the “Board”) of the Company is soliciting your proxy to vote at the Annual Meeting to be held on May 23, 2019, at 10:00 a.m. (Central Time) and at any postponements or adjournments of the Annual Meeting. This proxy statement summarizes information that is intended to assist you in making an informed vote on the proposals described in this proxy statement. Only stockholders of record, as of the record date, are entitled to vote at the Annual Meeting. The record date to determine stockholders entitled to notice of and to vote at the Annual Meeting is the close of business on March 25, 2019. On the record date, there were 21,952,650 shares of our common stock, par value $0.01 per share, outstanding. Our common stock is the only class of voting securities outstanding. How many shares must be present to conduct the Annual Meeting? We must have a quorum present in person or by proxy to conduct the Annual Meeting. A quorum is established when a majority of shares entitled to vote is present in person or represented by proxy at the Annual Meeting. Abstentions and broker non-votes (as described below) are counted for purposes of determining whether a quorum is present. What matters are to be voted on at the Annual Meeting? conduct any other business properly brought before the meeting or any adjournments or postponements thereof. As of the date of this proxy statement, we do not know of any other matters to be presented at the Annual Meeting. However, if any other matters properly come before the Annual Meeting, the persons named in your proxy will be authorized to vote or otherwise act in accordance with their judgment. FOR the approval, on an advisory basis, of the compensation of the Company’s named executive officers. By Mail – You can vote by completing, dating, signing and returning the proxy card in the enclosed postage-paid envelope. Telephone and Internet voting facilities for stockholders of record will be available 24 hours a day. You may vote over the telephone or via the Internet until 10:59 p.m. (Central Time) on May 22, 2019. Even if you plan to attend the Annual Meeting in person, we recommend that you also submit your proxy or voting instructions as described above so that your vote will be counted if you later decide not to attend the Annual Meeting in person. Your proxy will be voted in accordance with your instructions, so long as, in the case of a proxy card returned by mail, such card has been signed and dated. If you vote your shares via the Internet, by telephone or by executing and returning a proxy card by mail but you do not provide specific instructions with respect to the proposals, your shares will be voted FOR the director nominees named in this proxy statement, FOR the ratification of the appointment of our independent registered public accounting firm, and FOR the advisory approval of the compensation of our named executive officers, as described in this proxy statement. As of the date of this proxy statement, we do not know of any other matters to be presented at the Annual Meeting except those described in this proxy statement. If any other matters properly come before the Annual Meeting, however, the persons named in the enclosed proxy will be authorized to vote or otherwise act in accordance with their judgment. What should I do if I receive more than one set of proxy materials from the Company? If you hold your shares in multiple accounts or registrations, or in both registered and street name, you may receive proxy materials for each account. Please vote by telephone or via the Internet for each Notice and set of proxy materials that you receive, or vote by mail by signing, dating and returning all proxy cards you receive from the Company. Only the latest dated proxy that you submit for each account will be voted and counted. Yes. You may revoke your proxy at any time before it is voted at the Annual Meeting. To change your vote, if you are a stockholder of record, you may submit another later dated proxy by telephone, Internet or mail or by voting your shares in person at the Annual Meeting (your attendance at the Annual Meeting will not, by itself, revoke your proxy; you must vote in person at the Annual Meeting to revoke your proxy). If you are a beneficial owner and your shares are held in street name, you may change your vote by submitting new voting instructions to your bank, broker, trustee or nominee, or if you have obtained a legal proxy from such entity giving you the right to vote your shares, you may change your vote by attending the Annual Meeting and voting in person. What vote is required to elect directors and approve the other matters described in this proxy statement? Consistent with good governance policies, the Company’s amended and restated bylaws (“Bylaws”) provide for majority voting in uncontested elections. Because this is an uncontested election, the director nominees must receive the affirmative vote of a majority of the votes cast to be elected (i.e., the number of shares voted “for” a director nominee must exceed the number of votes cast “against” that nominee) (Proposal No. 1). Abstentions and broker non-votes will have no effect on the outcome of the election of directors. For the ratification of the appointment of PricewaterhouseCoopers LLP as our independent registered public accounting firm (Proposal No. 2) and the approval, on an advisory basis, of the compensation of the Company’s named executive officers (Proposal No. 3), the affirmative vote of the holders of a majority of the shares represented in person or by proxy and entitled to vote on the proposal will be required for approval. Abstentions will not be voted but will be counted for purposes of determining whether there is a quorum. Accordingly, abstentions will have the effect of a negative vote on Proposals No. 2 and 3. Broker non-votes will have no effect on Proposal No. 3. If your shares are registered in your name on the Company’s books and records or with our transfer agent, you are the “stockholder of record” of those shares, and this proxy statement and accompanying materials have been provided directly to you by the Company. On the other hand, if you purchased your shares through a brokerage or other financial intermediary, the brokerage or other financial intermediary will automatically put your shares into “street name” which means that the brokerage or other financial intermediary will hold your shares in its name or another nominee’s name and not in your name, but will keep records showing you as the “beneficial owner.” If you hold shares beneficially in street name, this proxy statement and accompanying materials have been forwarded to you by your broker, bank or other holder of record. How do I vote if my bank or broker holds my shares in “street name”? If you hold your shares in “street name” through a bank, broker or other nominee, such bank, broker or nominee will vote those shares in accordance with your instructions. To so instruct your bank, broker or nominee, you should refer to the information provided to you by such entity. Without instructions from you, a bank, broker or nominee will be permitted to exercise its own voting discretion with respect to so-called routine matters but will not be permitted to exercise voting discretion with respect to non-routine matters. The only routine matter on our agenda for the Annual Meeting is Proposal No. 2 (ratification of auditors). Proposals No. 1 (director elections) and 3 (advisory vote on the compensation of our named executive officers) are each non-routine matters. Thus, if you do not give your bank, broker or nominee specific instructions with respect to Proposal No. 2, your shares will be voted in such entity’s discretion. If you do not give your bank, broker or nominee specific instructions with respect to the remaining proposals, your shares will not be voted on such proposals. This is called a “broker non-vote.” Shares represented by such broker non-votes will be counted in determining whether there is a quorum and will have the effect described above on each of the non-routine proposals. We urge you to provide your bank, broker or nominee with appropriate voting instructions so that all your shares may be voted at the Annual Meeting. Each share of common stock that you hold as of the record date entitles you to one vote, without cumulation, on each matter to be voted upon at the Annual Meeting. How will the votes be counted at the Annual Meeting? The votes will be counted by the inspector of elections appointed for the Annual Meeting. How will the Company announce the voting results? The Company will report the final results of the voting at the Annual Meeting in a filing with the SEC on a Current Report on Form 8-K.
Who pays for the Company’s solicitation of proxies? The Board is soliciting your proxy to vote your shares of common stock at our Annual Meeting. We will bear the cost of soliciting proxies on behalf of the Company, including preparing, printing and mailing this proxy statement. Proxies may be solicited personally, by mail, email or by telephone by certain of our directors, officers, employees or representatives. Our directors and employees will not be paid any additional compensation for soliciting proxies. We will reimburse brokerage houses, banks, custodians, and other nominees and fiduciaries for out-of-pocket expenses incurred in forwarding our proxy solicitation materials. What is “householding” and how does it work? Under the rules adopted by the SEC, we may deliver a single set of proxy materials to one address shared by two or more of our stockholders. This delivery method is referred to as “householding” and can result in significant cost savings. To take advantage of this opportunity, we have delivered only one set of proxy materials to multiple stockholders who share an address, unless we received contrary instructions from the impacted stockholders prior to the mailing date. We agree to deliver promptly, upon written or oral request, a separate copy of the proxy materials, as requested, to any stockholder at the shared address to which a single copy of these documents was delivered. If you prefer to receive separate copies of the proxy statement or annual report, contact Broadridge Financial Solutions, Inc. by calling 1-866-540-7095 or in writing at 51 Mercedes Way, Edgewood, New York 11717, Attention: Householding Department. In addition, if you currently are a stockholder who shares an address with another stockholder and would like to receive only one copy of future notices and proxy materials for your household, you may notify your broker if your shares are held in a brokerage account or you may notify us if you hold registered shares. Registered stockholders may notify us by contacting Broadridge Financial Solutions, Inc. at the above telephone number or address. Attendance at the Annual Meeting or any adjournment or postponement thereof will be limited to record and beneficial stockholders as of the record date (March 25, 2019), individuals holding a valid proxy from a record holder, and other persons authorized by the Company. If you are a stockholder of record, your name will be verified against the list of stockholders of record prior to your admittance to the Annual Meeting or any adjournment or postponement thereof. You should be prepared to present photo identification for admission. If you hold your shares in a street name, you will need to provide proof of beneficial ownership on the record date, such as a brokerage account statement showing that you owned stock as of the record date, a copy of a voting instruction form provided by your broker, bank or other nominee, or other similar evidence of ownership as of the record date, as well as your photo identification, for admission. If you do not provide photo identification or comply with the other procedures described above, you will not be admitted to the Annual Meeting or any adjournment or postponement thereof. For security reasons, you and your bags may be subject to search prior to your admittance to the Annual Meeting. Upon the recommendation of our Nominating and Governance Committee (the “Nominating and Governance Committee”), the Board has nominated the seven individuals listed below to stand for election to the Board for a one-year term ending at the annual meeting of stockholders in 2020 or until their successors, if any, are elected or appointed prior thereto. All of the director nominees listed below have consented to being named in this proxy statement and to serve if elected. However, if any nominee becomes unable to serve, proxy holders will have discretion and authority to vote for another nominee proposed by our Board. Alternatively, our Board may reduce the number of directors to be elected at the Annual Meeting. Ms. Avril has served as a director of the Company since February 2014. Ms. Avril previously served as President and Chief Executive Officer of IPSCO Tubulars, Inc., a large North American producer of oil, gas and structural welded pipe, seamless pipe and premium connections and provider of oil field services, from 2008 until 2013. Prior to that, Ms. Avril held various positions, including Senior Vice President and Chief Financial Officer at IPSCO, Inc. and Senior Vice President and Chief Financial Officer at Wallace Computer Services, Inc. Ms. Avril currently serves on the Boards of Directors of Greif, Inc. (NYSE: GEF, GEF B), an industrial packaging and services company, for which she serves as the chairperson of the Special Compensation Committee, Commercial Metals Company (NYSE: CMC), a global metals recycling, manufacturing, fabricating, and processing company, for which she serves on their Compensation and Nominating and Governance Committees, and Finning International, the world’s largest Caterpillar dealer, for which she serves on the Audit and Safety, Environment & Social Responsibility Committees. Ms. Avril graduated with a B.S. in accounting from the University of Illinois at Urbana-Champaign and obtained a M.B.A. from the University of Chicago. Ms. Avril brings to the Board extensive management and leadership experience, including in the manufacturing industry, and extensive knowledge of accounting, finance, and M&A matters through her experience as a Chief Financial Officer for various public companies. For these reasons, we believe she is well qualified to serve on the Board. Mr. Marsh has served as a director of the Company since January 2014. Mr. Marsh was President, Principal Executive Officer and Chief Operating Officer of Castle Brands, Inc. (NYSE American: ROX), a distillery company, from November 2007 to October 2008. Prior to that, he was a consultant to Castle Brands, Inc. from March 2007. Mr. Marsh was Chief Financial Officer and Head of Corporate Development for Commonwealth Industries, Inc., previously a publicly traded aluminum manufacturer, from 1996 to 2005. Additionally, Mr. Marsh served as an Executive Vice President and Managing Director of Commercial and Investment Banking at J.P. Morgan Chase. Currently Mr. Marsh serves as Chief Revenue Officer of Priv8Pay Inc. since 2015. Mr. Marsh holds a B.S. in engineering from Princeton University and an M.B.A. from Harvard University School of Business. Mr. Marsh brings to the Board senior level management and leadership experience, including as the Chief Executive Officer and Chief Operating Officer of a public company, and financial and accounting expertise. For these reasons, we believe he is well qualified to serve on the Board. Mr. Ray has served as a director of Global Brass and Copper Holdings, Inc. since December 2014. Mr. Ray served as Chairman of the Board of Directors and Chief Executive Officer from 2002 to 2010 of Steel Technologies, Inc., one of the leading steel processors in North America, and continued to serve as an advisor to Steel Technologies, Inc. until 2012. Prior to 2002, Mr. Ray held various positions at Steel Technologies, Inc., including Director, President and Vice President of Manufacturing. In addition, as of December 31, 2014, Mr. Ray was appointed to the Boards of Directors of Limestone Bancorp, Inc. and Limestone Bank, Inc. As a result of his industry and public company experience, we believe he is well qualified to serve on the Board. Mr. Walker has served as our Non-Executive Chairman since March 17, 2014, following his retirement as Chief Executive Officer of the Company. Mr. Walker previously served as Executive Chairman since November 2013 and Chief Executive Officer of Global Brass and Copper Holdings, Inc. and as a director of Global Brass and Copper Holdings, Inc. since 2007. From 2003 to 2006, he served as Chief Executive Officer and President of The Boler Company, a major transportation manufacturer. Additionally, he currently serves as a director of Nucor Corporation (NYSE: NUE), a major steel manufacturer, for which he serves as Lead Director and Chairman of the Nominating and Governance Committee. Mr. Walker also serves as a director of Owens-Illinois, Inc. (NYSE: OI), a container glass products company. From 2002 to 2016, Mr. Walker served as a director for United Continental Holdings, Inc. (NASDAQ GS: UAL), a global airline. Mr. Walker served as a director of Delphi Corporation (NYSE: DLPH), an auto parts manufacturer, from 2005 to 2009 and of The Boler Company from 2003 to 2006. Mr. Walker provides valuable business expertise and extensive management knowledge to the Board, having served as our Chief Executive Officer and in key management and operational oversight roles in various other corporations. He also brings consulting and strategy expertise from his early career with McKinsey & Company, a global management consulting firm. Mr. Walker brings audit and financial experience to the Board through his service on the Audit Committees of United Continental Holdings, Inc., Delphi Corporation and Nucor Corporation, and knowledge of director and executive compensation through his service on the Compensation Committees of United Continental Holdings, Inc. and Nucor Corporation. For the foregoing reasons, we believe Mr. Walker is well qualified to serve as the Non-Executive Chairman of the Board. Mr. Wasz was appointed as the Chief Executive Officer and elected as a director of Global Brass and Copper Holdings, Inc. on March 17, 2014. Mr. Wasz does not serve as a director to any outside company. Mr. Wasz has served as the President of Global Brass and Copper Holdings, Inc. since September 6, 2013 and as the Chief Operating Officer of Global Brass and Copper Holdings, Inc. since January 9, 2012. Mr. Wasz served as President of GBC Metals, LLC, (d/b/a Olin Brass) until December 2014. From 2008 to 2009, he was the Special Advisor to the Chief Executive Officer of Aleris International, Inc. From 2004 to 2008, Mr. Wasz served as Executive Vice President and President of Aleris Rolled Products North America, an aluminum manufacturer. Prior to that time, from 1999 to 2001, he served as Executive Vice President and President of Alflex, a manufacturer of electrical armored cable, and prior to that Mr. Wasz held the position of Vice President of Operations of Alflex. Additionally, Mr. Wasz has served in several other management capacities. Mr. Wasz holds a B.A. in economics from DePauw University, and he attended the advanced management program at the Harvard Business School. We believe Mr. Wasz’s management and leadership experience with the Company, his service as our Chief Executive Officer and his manufacturing industry experience makes him well qualified to serve on the Board. Mr. Welch has served as a director of Global Brass and Copper Holdings, Inc. since July 2011. Mr. Welch served as Executive Vice President and Chief Financial Officer of Visteon Corporation (COMP: VC), a global automotive parts supplier, from 2011 to 2012. Mr. Welch served as Executive Vice President and Chief Financial Officer of United Rentals, Inc. (NYSE: URI), an industrial and construction equipment rental company, from 2005 to 2009, and concurrently from 2002 to 2008, he served as business advisor to the private equity firm York Management Services. Mr. Welch served on the Board of Directors and chaired the Audit Committee of Delphi Corporation (NYSE: DLPH) from 2006 to 2009. Mr. Welch served as Chief Financial Officer of Kmart Corporation, a major retailer, from 1995 to 2001. From 1991 until 1995, Mr. Welch served as Chief Financial Officer for Federal-Mogul Corporation, an automotive parts supplier. Mr. Welch serves on the Board of Directors of Allegion Plc (NYSE: ALLE) where he chairs the Audit Committee. Mr. Welch holds a B.S. degree in accounting and an M.B.A. from the University of Detroit Mercy. Mr. Welch is a certified public accountant. Mr. Welch has acquired important business leadership, financial and accounting skills from his career in the retail, business services, and automotive industries, including through his tenure as chief financial officer of Visteon Corporation, United Rentals, Inc., Kmart Corporation and Federal-Mogul Corporation. We believe these skills make him well suited to serve on the Board. Mr. Whitaker has served as a director of Global Brass and Copper Holdings, Inc. since July 2011 and previously served as our Lead Independent Director (through February 2017). Mr. Whitaker served as the President and Chief Executive Officer of Hyco International Inc., a major manufacturer of hydraulic cylinders, from 2003 to 2011. From 1995 to 2003, he served as Chief Executive Officer and Chairman of the Board of various manufacturing companies, including Strategic Distributions, Inc., a distributor of items to industrial customers, Johnson Outdoors Inc. (NASDAQ: JOUT), a sporting goods manufacturer, and EWI (Studebaker) Inc., an automotive tier-1 stampings supplier. Mr. Whitaker serves on the Boards of Directors of Sturm Ruger & Co. (NYSE: RGR), a firearms manufacturer, Walbec Group (formerly known as Payne & Dolan Inc.), a road and bridge construction company, as a member of the advisory board for the Manufacturing Policy Initiative of the Indiana University School of Public and Environmental Policy, and The Savannah Music Festival. Mr. Whitaker served on the Board of Directors of Pangborn Corp., an industrial surfacing company. Mr. Whitaker holds a degree in economics from the College of Wooster and an M.B.A. from Dartmouth’s Tuck School of Business. We believe Mr. Whitaker’s extensive background in turnaround leadership, corporate strategy, operations and marketing make him well qualified to serve on the Board. THE BOARD UNANIMOUSLY RECOMMENDS A VOTE “FOR” THE ELECTION OF EACH OF THE DIRECTOR NOMINEES NAMED IN THIS PROXY STATEMENT. PROXIES SOLICITED BY THE BOARD WILL BE VOTED FOR THE ELECTION OF EACH OF THE DIRECTOR NOMINEES NAMED IN THIS PROXY STATEMENT UNLESS STOCKHOLDERS SPECIFY A CONTRARY VOTE. Our executive officers as of the date of this proxy statement are as follows. Each is a citizen of the U.S. unless otherwise indicated. John J. Wasz – Mr. Wasz was elected as the Chief Executive Officer and President and as a director of Global Brass and Copper Holdings on March 17, 2014. Mr. Wasz previously served as the President of Global Brass and Copper Holdings since September 6, 2013, as the Chief Operating Officer of Global Brass and Copper Holdings since January 9, 2012 and as the President of Olin Brass since 2010. From 2008 to 2009, he was the Special Advisor to the Chief Executive Officer of Aleris International, Inc. From 2004 to 2008, Mr. Wasz served as Executive Vice President and President of Aleris Rolled Products North America, an aluminum manufacturer. Prior to that time, from 1999 to 2001, he served as Executive Vice President and President of Aflex, a manufacturer of electrical armored cable, and prior to that Mr. Wasz held several other management capacities at Commonwealth Industries. Mr. Wasz holds a bachelor’s degree in economics from DePauw University, and he attended Harvard Business School’s Advanced Management Program. Christopher J. Kodosky – Mr. Kodosky has served as the Chief Financial Officer of Global Brass and Copper Holdings since July 1, 2016. Prior to this role, he served as Vice President of Finance after joining Global Brass and Copper Holdings in December 2014. For the preceding ten years, Mr. Kodosky was employed in various capacities within AMCOL International Corporation, most recently as Chief Financial Officer of its Performance Materials segment. AMCOL provided specialty consumer and industrial products and services to various industries, including metalcasting, fabric care, cat litter, building materials, transportation, and oilfield services industries. From 2000 to 2004, Mr. Kodosky served in financial and corporate development roles within GVW Holdings, a private equity backed assembler of automotive chassis and industrial vehicles. Mr. Kodosky started his career providing merger and acquisition services for Coopers & Lybrand. Mr. Kodosky holds a degree in accountancy from the University of Illinois at Urbana-Champaign and an M.B.A. from Northwestern University’s Kellogg School of Management. Anne-Marie W. D’Angelo – Ms. D’Angelo has served as General Counsel and Corporate Secretary of Global Brass and Copper Holdings since November 10, 2017. Ms. D’Angelo joined Global Brass and Copper Holdings in May 2017 as Associate General Counsel. Prior to joining Global Brass and Copper Holdings, Ms. D’Angelo spent thirteen years at McDonald’s Corporation (NYSE: MCD), where she held various roles of increasing responsibility including serving as General Counsel for a multi-billion dollar division of McDonald’s USA, LLC and Assistant U.S. General Counsel of McDonald’s. Ms. D’Angelo started her career at a midsize Chicago law firm specializing in commercial real estate and corporate transactions. Ms. D’Angelo holds a Juris Doctor degree from the University of Notre Dame and a bachelor’s degree in English from the College of the Holy Cross. She is a member of the Illinois Bar. Devin K. Denner – Mr. Denner has served as the President of Chase Brass since 2007. Prior to this role, he was Vice President and General Manager of Chase Brass from 2006 to 2007 and before that held executive positions of increasing responsibility with Olin Corporation. He has led multiple business acquisition integration efforts during his career. He is well respected in the metals industry having recently served as the Chairman of the Copper and Brass Fabricators Council. He presently serves as the Vice-Chairman of the Copper Development Association. Mr. Denner holds a Bachelor of Science degree in mechanical engineering from the Missouri University of Science and Technology and an M.B.A. in finance from Saint Louis University. Gregory B. Keown – Mr. Keown has served as the President of AJ Oster since December 3, 2018. Prior to this role, Mr. Keown has held various roles within the Company, most recently serving as the Vice President of Marketing and International at Olin Brass from March 2016 to November 2018. From December 2014 to March 2016, he served as Vice President of Marketing and Sales Strip for Olin Brass. Prior to that, Mr. Keown served as Director of Supply Chain at Olin Brass from December 2012 to December 2014. Previously, Mr. Keown spent over a decade at Aleris Corporation. Mr. Keown holds a Bachelor’s degree in business management from the University of Southern Indiana, and he completed the Advanced Management Program at Harvard Business School in 2016. He is a member of the Copper Development Association. Dale R. Taylor – Mr. Taylor has served as President of Olin Brass since April 3, 2017. Prior to this role, Mr. Taylor served as the Vice President of Manufacturing for Olin Brass. Mr. Taylor had also served as the first Vice President of Supply Chain Planning during which time he integrated sales and operational planning systems for Olin Brass. Prior to this role Mr. Taylor had held management positions of increasing responsibility with Olin Brass and Olin Corporation. Mr. Taylor holds a Bachelor of Science degree in engineering management from the University of Missouri-Rolla, and he completed the General Management Program at Harvard Business School in 2013. William G. Toler – Mr. Toler has served as Executive Vice President, Strategic Planning and Development, since April 3, 2017. Previously Mr. Toler served as President of Olin Brass from December 19, 2014 to April 3, 2017. Mr. Toler also previously served as President of the Olin Brass Mill Products division since January 2013, and as Vice President of Finance and Information Technology at Olin Brass since March 2011. From 2005 to 2011, Mr. Toler was the President and Chief Executive Officer of Smelter Service Corporation, an aluminum recycler. From 2002 to 2004, Mr. Toler was Vice President of Materials and Corporate Development with Commonwealth Industries, an aluminum manufacturer. Mr. Toler brings an additional 29 years of executive management experience in a variety of fields. He holds a bachelor’s degree in Business Administration from Campbellsville University and attended Harvard Business School’s Advanced Management Program. Our Corporate Governance Guidelines provide guidelines with respect to the consideration of director candidates. Based on these guidelines, the Nominating and Governance Committee will review annually the relationships that each director has with the Company either directly or as a partner, member, stockholder, director or officer of an entity or organization that has a relationship with the Company. The Nominating and Governance Committee will review with the Board, on a periodic basis, the skills and characteristics required of the Board members in the context of the current director candidates in accordance with its charter. The Board itself will be ultimately responsible for selecting its own members and nominating them for election by stockholders. The Nominating and Governance Committee will consider director candidates who are proposed by the Company’s stockholders in accordance with the Bylaws, the Nominating and Governance Guidelines and any other policies and procedures established from time to time by the Nominating and Governance Committee. The following table highlights specific experience, qualifications, attributes, skills and background information that the Board considered for each director. A particular director may possess additional experience, qualifications, attributes, or skills, even if not expressly indicated below. In accordance with the Corporate Governance Guidelines, the Nominating and Governance Committee will consider candidates for election as a director of the Company recommended by any stockholder, provided that the recommending stockholder follows the procedures set forth in Section 3.3 of the Bylaws for nominations by stockholders of persons to serve as directors. The Nominating and Governance Committee would evaluate such candidates in the same manner by which it evaluates other director candidates considered by the Nominating and Governance Committee, as described above. Pursuant to Section 3.3 of the Bylaws, all nominations of stockholder nominees must be made by timely written notice given by a stockholder of record of the Company. To be timely, the notice must be delivered personally or mailed to and received at the Company’s office, addressed to the attention of the Corporate Secretary. In the case of the nomination at an annual meeting of stockholders, no earlier than 120 days and no later than 90 days before the first anniversary of the date of the prior year’s annual meeting of stockholders; provided, however, that if the annual meeting of stockholders is more than 30 days earlier or 60 days later than the first anniversary of the prior year’s annual meeting of stockholders, no annual meeting was held during the prior year, the notice by the stockholder must be received no earlier than 120 days before such annual meeting and no later than the later of 90 days before such annual meeting or the tenth day after the day on which the notice of such annual meeting was made by mail or was otherwise publicly disclosed. The stockholder’s notice or recommendation is required to contain certain prescribed information about each person whom the stockholder proposes to recommend for election as a director, the stockholder giving notice and the beneficial owner, if any, on whose behalf notice is given. The stockholder’s notice must also include the consent of the person proposed to be nominated and to serve as a director if elected. Recommendations or notices relating to director nominations should be sent to Global Brass and Copper Holdings, Inc., 475 N. Martingale Road Suite 1050, Schaumburg, Illinois 60173; Attention: Anne-Marie W. D’Angelo, General Counsel and Corporate Secretary. A copy of our Bylaws has been filed as an exhibit to our Form 8-K filed on March 10, 2015. Our common stock is listed on the New York Stock Exchange (the “NYSE”). The NYSE rules require that a majority of the members of our Board and each of the members of our Compensation and Nominating and Governance Committees be independent. As of the date of this proxy statement, we have satisfied such NYSE requirements. The Board has determined that Ms. Avril and Messrs. Marsh, Ray, Walker, Welch and Whitaker are “independent directors” as such term is defined by the applicable rules and regulations of the NYSE. Mr. Wasz does not qualify as an independent director, for purposes of the NYSE, because he is our current Chief Executive Officer and President. The Board has an oversight role, as a whole and also at the committee level, in overseeing management of our risks. Our Board focuses on our general risk management strategy, the most significant risks facing us, and oversees the implementation of risk mitigation strategies by management. The Board regularly reviews information regarding our credit, liquidity and operations, as well as the risks associated with each. The Compensation Committee of the Board is responsible for overseeing the management of risks relating to our employee compensation plans, policies and programs, as well as our annual report on executive compensation for inclusion in each proxy statement and the Audit Committee of the Board oversees the management of financial risks. The Nominating and Governance Committee of the Board is responsible for overseeing the management of risks relating to corporate governance matters. While each committee is responsible for evaluating certain risks and overseeing the management of such risks, the entire Board is regularly informed through committee reports about such risks. an integral part of our corporate culture and is reflected in the way we conduct business. We believe that outstanding performance in these areas directly contributes to the success of our Company. We strive to achieve a ‘Best in Class’ performance status for employee safety. Our corporate values, policies (including our Code of Business Conduct and Ethics) and procedures are aligned to promote care and concern for others, keeping ourselves and others safe and healthy. Our employees are provided with the knowledge, skills and abilities to work safely and maintain a healthy environment through our annual Safety Excellence Conference. Additionally, a number of our locations participate in the Occupational Safety and Health Administration (“OSHA”) sponsored Voluntary Protection Program, or VPP. The Safety Excellence and VPP initiatives evidence our proactive approach, which stresses strong employee participation and collaboration, management accountability, employee training and hazard elimination as core foundational elements. In 2018, our A.J. Oster facilities in Alliance, Ohio and Carol Stream, Illinois were recognized as VPP Star sites. In 2016, our A.J. Oster facility in Yorba Linda, California was recognized as a VPP Star site. This recognition reflects the facilities’ achievement in the development, implementation and continuous improvement of their safety and health management system resulting in injury and illness rates that are below the national averages for the industry. We also promote mutual respect for the diverse backgrounds, talents and capabilities of our workforce. We are sensitive to the environmental, health and safety consequences of our operations. Accordingly, we strive to maintain compliance with all applicable Federal and State environmental laws and regulations, including, among others, the Clean Air Act, the Federal Water Pollution Control Act, the Resource Conservation and Recovery Act and the Occupational Safety and Health Act. Our long-standing commitment to good environmental stewardship is evidenced by the initiatives and programs we have developed and maintained and awards we have received. For three years in a row, Olin Brass has been awarded the “Energy Star Partner of the Year” award from the United States Environmental Protection Agency. The purpose of the award is to honor businesses and organizations that have made outstanding contributions to protecting the environment through superior energy efficiency achievements. In the area of heavy industrial manufacturing, Olin Brass is the only producer of non-ferrous strip products to receive such a designation. Our internal reporting programs are designed to monitor, evaluate and improve environmental, health and safety performance. Our initiatives include projects focused on recycling and waste reduction. As an industrial manufacturing company, we are fortunate that our primary base materials are brass and copper. Brass and copper are sustainable materials that are fully and infinitely recyclable, and the majority of the end products we manufacture continue to come from previously recycled material. We are a responsible corporate citizen with our employees, customers, business partners and communities. The Company is committed to programs that ensure health and safety of our employees, protection of the environment and enrichment of our communities. In addition to ongoing programs embedded within our enterprise risk management programs, additional areas of focus, including environmental, social and governance matters, are reviewed by management with the Board annually. The Board has assigned responsibility to oversee sustainability issues, including as it pertains to environmental and corporate social responsibility matters, to the Nominating and Governance Committee. The Board has approved Corporate Governance Guidelines and a Code of Conduct and Ethics. All of our corporate governance documents, including the Corporate Governance Guidelines, the Code of Business Conduct and Ethics and committee charters, are available on our website at www.gbcholdings.com or in printed form upon request by contacting Global Brass and Copper Holdings, Inc. at 475 N. Martingale Road Suite 1050, Schaumburg, Illinois 60173, Attention: Investor Relations. The Board regularly reviews corporate governance developments and will modify these documents as warranted. Any modifications will be reflected on our website. The information on our website is not part of this proxy statement and is not deemed to be incorporated by reference herein. The Board has determined that the appropriate leadership structure for the Board at this time is for Mr. Walker, our former Chief Executive Officer, to serve as Non-Executive Chairman of the Board. Mr. Walker possesses detailed and in-depth knowledge of the issues, opportunities, and challenges facing the Company and its businesses and is thus best positioned to develop agendas that ensure that the Board’s time and attention are focused on the most critical matters. We believe that this structure is appropriate for the Company because it allows our Chairman to lead the Board in its fundamental role of managing the Company and providing advice to management, while also providing for effective oversight by a majority of independent directors and allowing our Chief Executive Officer and President to focus on the execution of our business strategy, growth and development. We do not have a formal policy that requires the positions of Chairman and Chief Executive Officer to be separate, and the Board, in its discretion, may decide to change the leadership structure. Currently, the Chairman of our Board is our former Chief Executive Officer and the Board has determined that a lead independent director is not necessary at this time. In the future, the Company may choose to appoint a lead independent director to coordinate the activities of the other non-management directors, and to perform such other duties and responsibilities as the Board may from time to time determine. Through February 2017, Ronald C. Whitaker served as our lead independent director, and after such time, the role of the lead independent director concluded with the determination that Mr. Walker, the Chairman of the Board, was independent. While serving as lead independent director, Mr. Whitaker has followed governance practices established by the Board that support effective communication and effective Board performance. In 2018, our Board held twelve meetings. In addition to our Board meetings, our directors attend meetings of committees established by our Board. Each of our director nominees attended at least 75% of the meetings of our Board and the committees on which he or she served during 2018 that were held when he or she was a director. Our directors are encouraged to attend all annual and special meetings of our stockholders. In 2018, all seven directors attended the annual meeting of stockholders. Mr. Walker presides over non-management sessions. The Board has four standing committees: the Audit Committee, the Compensation Committee, the Executive Committee, and the Nominating and Governance Committee. The following chart sets forth the directors who currently serve as members of each of the Board committees. In 2018, the Audit Committee held eight meetings. Each of the members of the Audit Committee is a non-employee director. In addition, the Board has determined that all of the members of the Audit Committee are independent as defined in the listing standards of the NYSE and under Rule 10A-3 of the Exchange Act and that all such members are financially literate. The Board also has determined that all members of the Audit Committee are audit committee financial experts, as defined in Item 407(d) of Regulation S-K under the Exchange Act and have accounting or related financial management expertise. Our Corporate Governance Guidelines limit the number of public company audit committees on which an Audit Committee member can serve to three or fewer audit committees (including the Company’s Audit Committee) without approval of the Board. None of our Audit Committee members serve on more than three public company audit committees (including the Company’s Audit Committee). compliance by us with legal and regulatory requirements. For a further discussion of the Audit Committee’s responsibilities and findings, see “Audit Committee Report.” The Audit Committee operates under a written charter setting forth its functions and responsibilities. A copy of the current charter is available on our website at www.gbcholdings.com or in printed form upon request. In 2018, the Compensation Committee held six meetings. Each of the current members of the Compensation Committee is a non-employee director. In addition, the Board has determined that all of the members of the Compensation Committee are independent as defined (i) in the listing standards of the NYSE, including the specific independence requirements for compensation committee members and (ii) the Company’s corporate governance guidelines. Additionally, the Board has determined that all of the members of the Compensation Committee are outside directors for purposes of Section 162(m) of the Internal Revenue Code of 1986, as amended (the “Code”). providing regular reports to the Board and any Compensation Committee reports required by the SEC to be included in our proxy statement and annual report. The Compensation Committee has engaged Willis Towers Watson (“WTW”) as its independent compensation consultant. WTW reports directly to the Compensation Committee and assists in the review and design of our executive compensation program. The Compensation Committee has reviewed and confirmed the independence of WTW and concluded that their work for the Compensation Committee does not raise any conflict of interest. The Compensation Committee may form and delegate authority to subcommittees, including committees whose members are not members of the Board, as it deems appropriate. No subject employee should attend that portion of any meeting where the subject employee’s performance or compensation is discussed, unless specifically invited by the Compensation Committee. Meetings to determine the compensation of our Chief Executive Officer must be held in executive session. Meetings to determine the compensation of subject employees other than our Chief Executive Officer may be attended by our Chief Executive Officer, but our Chief Executive Officer may not vote on these matters. The Compensation Committee operates under a written charter setting forth its functions and responsibilities. A copy of the current charter is available on our website at www.gbcholdings.com or in printed form upon request. In 2018, the Nominating and Governance Committee held four meetings. Each of the current members of our Nominating and Governance Committee is a non-employee director. In addition, the Board has determined that all of the current members of the Nominating and Governance Committee are independent as defined in the listing standards of the NYSE. to perform such other functions as the Board may from time to time assign to the Nominating and Governance Committee. In performing its duties, the Nominating and Governance Committee shall seek to maintain an effective working relationship with the Board and our management. The Nominating and Governance Committee operates under a written charter setting forth its functions and responsibilities. A copy of the current charter is available on our website at www.gbcholdings.com or in printed form upon request. Our Board values the feedback and insights gained from frequent engagement with our stockholders. In 2018, in addition to interactions regarding our financial performance, we engaged with stockholders representing a significant portion of our outstanding shares on matters relating to our long-term business strategy and performance, corporate governance, executive compensation and corporate responsibility. Our engagement takes different forms, such as investor road shows, investor presentations and reports posted on our website and frequent informal conversations between investors and our Chief Financial Officer. We are committed to including our stockholders’ perspectives in boardroom discussions, and we believe that regular engagement with our stockholders is necessary in order to ensure thoughtful and informed consideration of those matters. Stockholders and interested parties can contact the Board or our non-employee directors through written communication sent to Global Brass and Copper Holdings, Inc., 475 N. Martingale Road Suite 1050, Schaumburg, Illinois 60173, Attention: Anne-Marie W. D’Angelo, General Counsel and Corporate Secretary. Our General Counsel reviews all written communications and forwards to the Board or our non-employee directors, as applicable, a summary and/or copies of any such correspondence that is directed to the Board or our non-employee directors, as applicable, or that, in the opinion of the General Counsel, deals with the functions of the Board, Board committees or our non-employee directors, as applicable, or that she otherwise determines require their attention. Concerns relating to accounting, internal accounting controls or auditing matters are immediately brought to the attention of our internal audit department and handled in accordance with procedures established by the Audit Committee with respect to such matters. Communications of a confidential nature can be made directly to the Chairman of the Audit Committee regarding any accounting, internal accounting control or auditing matter, by submitting such concerns to the Audit Committee. Any submissions to the Audit Committee should be marked confidential and addressed to the Chairman of the Audit Committee, c/o Global Brass and Copper Holdings, Inc., 475 N. Martingale Road Suite 1050, Schaumburg, Illinois 60173. Any submission should contain, to the extent possible, a full and complete description of the matter, the parties involved, and the date of the occurrence or, if the matter is ongoing, the date the matter was initiated and any other information that the reporting party believes would assist the Audit Committee in the investigation of such matter. Our Board maintains a detailed succession plan for the CEO and other key officers, which the Nominating and Governance Committee reviews at least once each year. The objectives for our non-employee director compensation program are to attract highly-qualified individuals to serve on our Board and align their interests with those of our stockholders. Our Compensation Committee reviews our director compensation program annually to confirm that the program remains appropriate and competitive, and recommends any changes to our full Board for consideration and approval. During 2018, the Compensation Committee engaged WTW, our independent compensation consultant, to review our compensation for non-employee directors and to make recommendations with regard to director compensation matters. Pursuant to this engagement, WTW found that our 2018 director compensation (described below) approximates the median of the Company’s peer group. As such, no adjustments were made to the director compensation program in 2018. The following table shows the director fees earned by our non-employee directors for 2018. In addition, we reimbursed the directors for reasonable expenses incurred in attending Board meetings. On May 24, 2018, each independent director received a grant of 3,313 shares of restricted stock, vesting one year from the date of grant. As of December 31, 2018, each director held 3,313 unvested shares of restricted stock. When we award shares of restricted stock, we round up the last fractional share so that the actual grant date fair value of the award generally is slightly above $105,000. Currently, our non-employee directors are eligible for an annual cash retainer of $75,000 and an annual equity award of $105,000. The chair of the Audit Committee receives an additional annual retainer of $20,000. The chair of the Compensation Committee receives an additional annual retainer of $15,000 and the chair of the Nominating and Governance Committee receives an additional $10,000 cash retainer. At our May 26, 2016 Annual Meeting of Stockholders, our stockholders approved an amendment and restatement of the Global Brass and Copper Holdings, Inc. 2013 Omnibus Equity Incentive Plan (the “Omnibus Plan”). Pursuant to this amendment and restatement, the Omnibus Plan provides that a non-employee director may not receive in any calendar year stock awards under the Omnibus Plan with an aggregate grant date fair market value greater than $300,000, whether or not such awards are settled in cash or in stock. This limit does not apply to any equity awards under the Omnibus Plan that a non-employee director elects to receive at fair market value in lieu of all or a portion of such non-employee director’s cash retainer. We maintain stock ownership guidelines for our non-employee directors because we believe it is vital to align our stockholders’ interests with those of our board and senior leadership. These guidelines provide a targeted ownership level of shares of common stock for each non-employee director equal to four times the annual cash retainer amount. As of December 31, 2018, each of our non-employee directors is in compliance with these guidelines. The following table sets forth, as of March 25, 2019 (except as indicated below), beneficial ownership, as defined by SEC rules, of our common stock by the persons or groups specified. Each of the persons listed below has sole voting and investment power with respect to the beneficially owned shares listed unless otherwise indicated. The percentage calculations set forth in the table are based on 21,952,650 shares of common stock outstanding on March 25, 2019, rather than based on the percentages set forth in stockholders’ Schedules 13G or 13D, as applicable, filed with the SEC. Based solely on the information in Amendment No. 3 to its Schedule 13G filed with the SEC on February 11, 2019, as of December 31, 2018. The Vanguard Group holds sole voting power as to 42,996 shares of common stock, shared voting power as to 7,100 shares of common stock, sole dispositive power as to 1,840,605 shares of common stock and shared dispositive power over 48,196 shares of common stock. The reporting person’s principal business address is 100 Vanguard Blvd., Malvern, PA 19355. Based solely on the information in Amendment No. 4 to its Schedule 13G filed with the SEC on February 4, 2019, as of December 31, 2018, BlackRock, Inc. holds sole voting power as to 1,758,780 shares of common stock and sole dispositive power over 1,869,271 shares of common stock. The reporting person’s principal business address is 55 East 52nd Street, New York, NY 10055. Based solely on the information in its Schedule 13G filed with the SEC on January 22, 2019, as of December 31, 2018, on behalf of Wells Fargo & Company (“Wells Fargo”) and various affiliates of Wells Fargo, including Wells Capital Management Incorporated (“WCMI”). Wells Fargo holds sole voting power and sole dispositive power as to 20,799 shares of common stock, shared voting power as to 1,075,679 shares of common stock and shared dispositive power as to 1,449,906 shares of common stock. WCMI has shared voting power as to 767 shares of common stock and shared dispositive power as to 1,426,464 shares of common stock. The reporting person’s principal business address of Wells Fargo is 420 Montgomery Street, San Francisco, CA 94163. Based solely on the information in its Schedule 13G filed with the SEC on February 12, 2019, as of December 31, 2018, Renaissance Technologies LLC holds sole voting and sole dispositive power as to 1,273,400 shares of common stock and shared dispositive power as to 23,379 shares of common stock. Renaissance Technologies Holdings Corporation reported the same beneficial ownership information as a result of its majority ownership of Renaissance Technologies LLC. The reporting person’s principal business address of 800 Third Avenue New York, New York 10022. Based solely on the information in its Schedule 13G filed with the SEC on February 11, 2019, as of December 31, 2018, American Century Investment Management, Inc. holds sole voting power as to 1,079,138 shares of common stock and sole dispositive power as to 1,148,553 shares of common stock. American Century Companies, Inc. and Stowers Institute for Medical Research reported the same beneficial ownership information as direct or indirect parent companies of American Century Investment Management, Inc. The reporting person’s principal business address of 4500 Main Street, 9th Floor, Kansas City, Missouri 64111. Based solely on the information in its Schedule 13G filed with the SEC on February 13, 2019, as of December 31, 2018, LSV Asset Management holds sole voting power as to 793,345 shares of common stock and sole dispositive power as to 1,109,440 shares of common stock. The reporting person’s principal business address of LSV Asset Management is 155 N. Wacker Drive, Suite 4600, Chicago, IL 60606. The total includes 243,490 stock option awards exercisable within 60 days. The total includes 24,218 stock option awards exercisable within 60 days. The total includes 66,971 stock option awards exercisable within 60 days. The total includes 4,040 stock option awards exercisable within 60 days. The total includes 61,210 stock option awards exercisable within 60 days. The total includes 399,929 stock option awards exercisable within 60 days. Based upon our review of reports filed with the SEC and written representations that no other reports were required, we believe that all of our directors and executive officers complied with the reporting requirements of Section 16(a) of the Exchange Act during 2018, except that the vesting of Kevin W. Bense’s stock options on September 4, 2018 was inadvertently reported late on a Form 4 filed on September 7, 2018. Our goal at Global Brass and Copper Holdings is to attract, motivate and retain a superior team of executives focused on continued growth, profitability and stockholder value. That is why our executive compensation program is built on a philosophy of aligning the interests of our executives with our stockholders, and it is why our program ensures that the executives’ compensation is aligned with our business performance. In 2018, our full-year volumes increased by 11.3% to 564.6 million pounds compared to 507.3 million pounds in 2017. Our net sales for the 2018 increased to $1.8 billion from $1.6 billion in 2017. Adjusted sales* increased by 15.1% to $616.6 million from $535.8 million in 2017. Our net income attributable to GBC for the year was $58.2 million, or $2.61 per diluted share, compared to $51.1 million, or $2.31 per diluted share, for 2017. Our adjusted EBITDA** was $128.5 million for 2018, a decrease of 1.5% as compared to 2017. Our adjusted diluted earnings per common share*** was $3.12 for 2018 as compared to $2.46 in 2017. As a result of our performance in 2018, our annual incentive plan paid out at above target levels for four of our five named executive officers and our LTI Plan paid out at below target levels for the 2017-2018 period for our named executive officers. Based on our performance in 2018, our LTI Plan is tracking above target levels for the 2018-2019 period. Overall, executive compensation for 2018 was consistent with our executive compensation objectives and reflects our operating performance, demonstrating our commitment to pay our executives for the performance they deliver. *Adjusted sales is a non-GAAP financial measure and is defined as net sales less the metal cost of products sold. **Adjusted EBITDA is a non-GAAP financial measure and is defined as net income attributable to Global Brass and Copper Holdings, Inc., plus interest, taxes, depreciation and amortization (“EBITDA”), adjusted to exclude the following: unrealized gains and losses on derivative contracts in support of our balanced book approach; unrealized gains and losses associated with derivative contracts related to energy and utility costs; impact associated with lower of cost or market adjustments to inventory; gains and losses due to the depletion of a LIFO layer of metal inventory; share-based compensation expense; refinancing costs; restructuring and other business transformation charges; inventory step-up costs related to acquisition accounting; specified legal and professional expenses; and certain other items. ***Adjusted diluted earnings per common share is a non-GAAP financial measure and is defined as diluted net income attributable to Global Brass and Copper Holdings, Inc. per common share adjusted to remove the per share impact of the add backs to EBITDA in calculating adjusted EBITDA. – 60% performance shares, subject to a two-year performance period. At the end of the performance period, the Compensation Committee will determine the amount of performance shares earned based on achievement of certain levels of Return on Invested Capital (ROIC). At that time, 50% of the performance shares earned will vest and be distributed immediately, and the other 50% earned will vest and be distributed one year after the performance determination, subject to the named executive officer’s continued employment with the Company. The delayed distribution (and continued vesting) of 50% of each performance share award further enhances their retention value and long-term alignment with stockholders’ interests. – 40% restricted stock, which will vest in three equal installments on each of the first, second and third anniversaries of the grant date, subject to the named executive officer’s continued employment with the Company. The compensation decisions outlined below demonstrate our strong commitment to paying for performance. In April 2018, we increased the salaries of all our named executive officers to more closely align them with the median percentile of our peer group. We considered each individual’s experience, competitive considerations, internal equity and input from the Compensation Committee’s independent compensation consultant, WTW, to guide our decisions. The pay increases ranged from 3.0% to 8.1%. ● Each named executive officers was eligible to receive an annual cash bonus for the 2018 performance year, and all named executives received a payout. ● Payouts ranged from 52% - 137.7% of target based on the achievement of both financial performance goals and key measurable objectives (individual goals) set at the start of 2018. Each named executive officer received a long-term equity grant for 2018. The amount awarded to each individual was based on the individual’s experience, competitive considerations and input from our independent compensation consultant, which benchmarked our equity practices to ensure that we remain competitive with our peer companies. The total long-term incentive opportunity for each named executive officer is expressed as a percentage of his/her base salary. In 2018, we stopped paying premiums on the executive life insurance policies we had maintained on certain executives since the acquisition of our metals businesses from Olin Corporation, pursuant to the purchase agreement. Based on approval of our executive compensation programs in our most recent advisory “say-on-pay” stockholder vote by approximately 94% of the votes cast, the Company is not making any substantial changes to our executive compensation program for 2019. For LTI awards, we modified the performance matrix for the 2019 performance shares to reflect 2019 budget and 2020 strategic projections and we adopted a new ROIC definition to include stock compensation costs. The performance share awards are to be earned based on a combination of return on invested capital (a percentage) at the end of 2020, accumulated ROIC dollars (a dollar amount) for 2019 and 2020 and stock price. Finally, we decided to terminate and distribute the executive life insurance policies we had maintained on certain executives in 2019. The target total direct compensation for Mr. Wasz in 2018 (base salary, annual cash bonus and long-term stock awards) was determined by the Compensation Committee in the spring of 2018. The Compensation Committee overall looks to target Mr. Wasz’s total direct compensation within a competitive range of the median of its peer group. A significant portion of Mr. Wasz’s total direct compensation is “at-risk,” including his cash bonus, performance shares and restricted stock. We believe that the long-term stock awards create a direct link between his future compensation and the value he helps create for our stockholders. To the extent target performance measures are not achieved, or they are exceeded, Mr. Wasz’s resulting compensation will be below or above the target total direct compensation, supporting our pay-for-performance philosophy. The following table breaks down in further detail the components of Mr. Wasz’s 2018 total compensation outside of his base salary. To see the business performance targets in greater detail, see page 27. Pay for performance is one of the guiding principles of our executive compensation program, and our Compensation Committee ensures that the philosophy is carried out in all aspects of our executive compensation package. Beyond base pay, we provide both short- and long-term incentives to our executives to encourage the effective management of major functions, teamwork, strategy development and execution, and oversight of key initiatives, all of which contribute to our Company’s performance and stockholder value. That is why the majority of our named executive officer’s compensation is “at-risk” and tied to the overall performance of Global Brass and Copper Holdings and its stock price. As an executive increases his/her scope of responsibilities, a greater portion of compensation becomes performance-based and at-risk, further emphasizing the connection between pay and performance. The Compensation Committee determines the appropriate level of compensation for all executive officers, including the Chief Executive Officer. The Chief Executive Officer and the Vice President of Human Resources present to the Compensation Committee their annual recommendations for pay and incentives for all executives. However, the chief executive officer does not make a recommendation regarding his own pay. The Compensation Committee sets the annual pay and target incentive compensation for each named executive officer. When setting the target compensation for the year, the Compensation Committee considers data from the Company’s peer group as well as broader industry studies and recommendations from its independent executive compensation consultant, Willis Towers Watson. At the completion of the year, the Compensation Committee confirms achievement of prior-year performance metrics and approves current fiscal year compensation within the first 45 days of the fiscal year. Short- and long-term incentive targets for the new fiscal year, as well as short-term incentive payouts and long-term incentive performance achievement, if applicable, are awarded after approval by the Compensation Committee and Board of Directors. The Compensation Committee engages WTW as an independent executive compensation consultant. WTW provides consulting advice regarding executive compensation, as well as data from the Willis Towers Watson Compensation Data Base and public sources such as proxy filings. These resources ensure that we maintain competitive compensation practices compared to our peers. During 2018, the Company paid WTW $184,836 for its executive compensation consulting. During 2018, the Company also paid WTW $4,866 for open enrollment consulting, which was not related to executive compensation. WTW annually prepares an executive compensation consultant independence letter, which specifies six factors that compensation committees must consider in selecting and monitoring the independence of their advisors and confirming that they are independent with no conflicts of interest. In 2018, our independent compensation consultant benchmarked the compensation for our named executive officers against a peer group of 16 companies. The peer group is also used to review annual and long-term incentive plan practices, independent director compensation, and other related analyses. These companies were selected by the Compensation Committee, with the advice of WTW. As discussed in the letter from our CEO at the beginning of this proxy statement, our Board of Directors and our Compensation Committee value the opinions of our stockholders regarding compensation and other issues. Our engagement takes different forms, such as investor road shows, investor presentations and reports posted on our website and frequent informal conversations between investors and our Chief Financial Officer. A key component of stockholder input on the design of our executive compensation programs and the specific compensation decisions for each of our named executive officers is the advisory “say-on-pay” vote at our annual meeting. In 2018, approximately 94% of the votes cast in our “say-on-pay” stockholder vote approved the compensation for our named executive officers. Based on this approval, the Company is not making any significant changes to our executive compensation program for 2019. 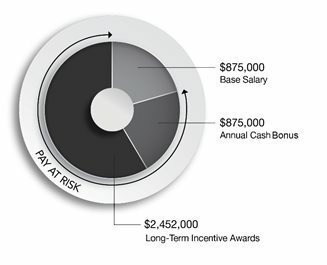 The following chart highlights key elements of our total rewards and how each is linked to the objectives of our executive compensation program. Base salaries for the named executive officers reflect the experience, skill level and responsibility of the individuals. The Compensation Committee determines the base salary, and any increases, for executive officers using external surveys of salary practices for positions with similar levels of responsibility at our peer group companies and taking into account the performance of the individual and the Company. The Compensation Committee reviews base salaries for our named executive officers annually but does not uniformly raise base salaries each year. Base salary increases for 2018 ranged from 3.0% (consistent with the Company’s overall merit budget) to 8.1%, with the higher increases made to better align these named executive officers’ salaries with the median percentile of our peer group. Our annual cash bonus rewards executives who achieve financial (Adjusted Diluted Earnings per Common Share and Segment Adjusted EBITDA) and individual targets over the course of a year. Our annual cash bonus plan is set up for two different groups of executives: corporate officers and business unit executives. All named executive officers were eligible to receive a cash award in 2018. Financial performance results are measured based on the level of achievement of the performance targets set at the start of the year. The chart at the right shows the percent of bonus payout for the financial metric based on the level of achievement of the performance target. Linear interpolation of the payout occurs between 85% and 100% achievement of the respective target and separately between 100% and 110% achievement of the respective target, with a maximum payout of 200% of the component based on the level of achievement of the respective target. The tables below show the financial and individual components, as well as the 2018 payout results, for our two different groups of executives: corporate officers and business unit executives. 30% based on supporting the Company’s strategic growth, leading business unit growth, and driving improvements in manufacturing operations, people, and technology. The Compensation Committee set a target annual incentive for each named executive officer based on the scope of each executive’s duties and respective individual capacity to affect our overall performance, while also ensuring the target performance percentage levels were competitive when compared to the peer group for Global Brass and Copper Holdings. The targets and actual payouts for each named executive officer are shown below. Each named executive officer’s Individual Bonus relates to the criteria necessary for such named executive officer to obtain any amount of the Individual Bonus from 0% to 200% of target. Messrs. Wasz, Kodosky and Toler were assessed on the progress they achieved in the Company’s strategic growth and in business unit growth, and driving improvements in the following key strategies, people, and embracing advance technology. Messrs. Denner and Taylor were also assessed on the progress they achieved in business unit growth, advance GBC/business unit strategy for acquisitions, manufacturing productivity, inventory turns, people and technology. Overall, with respect to the aggregate assessment of the Financial Metric and Individual Bonus performance measures, the Compensation Committee determined achievements and payouts as shown in the chart below. Our long-term incentive program directly connects executive compensation to Company performance — rewarding performance over the long term, serving as a retention tool and aligning our executives’ interests with stockholders’ interests. The equity grants our Compensation Committee made in 2018 are structured to drive achievement of our business strategy while ensuring sharp focus on critical results. 60% performance shares, subject to a two-year performance period. At the end of the performance period, the Compensation Committee will determine the amount of performance shares earned based on achievement of certain levels of Return on Invested Capital (ROIC), accumulated ROIC dollars, stock price and other factors. At that time, 50% of the performance shares earned will vest and be distributed immediately, and the other 50% earned will vest and be distributed one year after the performance determination, subject to the named executive officer’s continued employment with the Company. 40% restricted stock, which will vest in three equal installments on each of the first, second and third anniversaries of the grant date, subject to the named executive officer’s continued employment with the Company. All named executive officers received a long-term equity grant for 2018. The amount awarded to each individual was based on the individual’s experience and impact on the business, competitive considerations, retention risk, and input from our independent compensation consultant, which benchmarked our equity practices to ensure that we remain competitive with our peer companies. The total long-term incentive opportunity for each named executive officer is expressed as a percentage of his base salary. Performance shares awarded in 2018 are eligible to vest at the end of a two-year performance period (January 2018 – December 2019) based on the achievement of certain levels of ROIC, accumulated ROIC dollars, stock price and other factors. If the performance metrics are reached or exceeded, half of the award will vest immediately and half will vest and be distributed after an additional year. To receive the award, named executive officers must be employed by the Company at vesting. The second half of the performance shares earned for the 2016 – 2017 performance cycle were settled because the time-based vesting criteria was met. The Compensation Committee certified that the performance criteria for performance shares granted on February 9, 2017, were satisfied at the 50% level with respect to the 2-year performance period ending on December 31, 2018. Based on this result, 50% of the applicable performance shares vested and were distributed. The remaining 50% are scheduled to vest and be distributed in February 2020, subject to continued employment. The performance period runs through December 31, 2019, at which time the Compensation Committee will determine the actual percentage of the performance shares earned. We maintain stock ownership guidelines for members of senior management, including our named executive officers, who participate in our equity compensation programs because we believe it is vital to align our stockholders’ interests with those of our senior leadership. These guidelines provide a targeted ownership level of shares of common stock for each named executive officer position equal to a multiple of his base salary. Named executive officers are expected to retain a minimum of 75% of all shares (net of payment of option exercise prices, taxes and transaction costs) acquired pursuant to an award under the Omnibus Plan. The guidelines provide that once an executive achieves compliance, such executive will remain in compliance with the guidelines provided that he or she continues to hold or beneficially own the same or a greater number of eligible shares and/or units that were sufficient at that time to meet the targeted ownership level. On an annual basis, the Compensation Committee reviews, along with our independent compensation consultant, the Audit Committee, our Chief Financial Officer and our senior risk officers, our employee compensation programs as they relate to risk management and risk-taking incentives in order to determine whether any risk arising from such compensation programs is reasonably likely to have a material adverse effect on the Company. We do not believe that our compensation policies and practices give rise to risks that are reasonably likely to have a material adverse effect on us. Our incentive compensation programs generally reward a mix of different performance measures, some of which are the financial performance measures. Additionally, our long-term incentives directly connect compensation to our performance by featuring restricted stock and performance shares. We believe that this mix of performance criteria mitigates any incentive to seek to maximize short-term performance at the expense of long-term performance or to maximize performance under one measure to the detriment of performance under another measure. Maximum payouts under our incentive plans are capped at 200% of target payouts. And, our incentive compensation programs are designed with payout curves that are relatively smooth and do not contain steep payout “cliffs” that might encourage short-term business decisions in order to meet a payout threshold. We believe that these limits mitigate excessive risk-taking because the maximum amount that can be earned in a single cycle is limited. The incentive compensation for executives in key business segments is determined by company-wide performance measures as well as segment performance, to mitigate any incentive to pursue strategies that might maximize the performance of a single operating segment to the detriment of us as a whole. Our senior management is subject to our stock ownership guidelines, which we believe incentivize our senior management to consider our long-term interests and our stockholders’ long-term interests. Additionally, these guidelines discourage excessive risk-taking that could negatively impact our stock price. In December 2014, the Company adopted our Incentive Compensation Recoupment Policy (the “Recoupment Policy”) to provide for recovery of incentive compensation, if any, in excess of what would have been paid to our executive officers or former executive officers in the event that the Company is required to restate its financial results. The Recoupment Policy applies to all incentive-based cash and equity compensation awards granted on or after the 2014 effective date (“Incentive Compensation”) to any current or former executive officer of the Company (collectively, the “Covered Recipients”). In the event that the Company is required by applicable U.S. federal securities laws to prepare an accounting restatement due to the material noncompliance of the Company with any financial reporting requirement under such securities laws where such accounting restatement was caused or substantially caused by the intentional misconduct of the Covered Recipient, the Company will recover from such Covered Recipient who received Incentive Compensation during the three-year period preceding the date on which the Company is required to prepare an accounting restatement, based on the erroneous data, the amount, if any, in excess of what would have been paid to the Covered Recipient under the accounting restatement. The Recoupment Policy is administered by the Compensation Committee, which has the sole discretion in making all determinations under the Policy. The Recoupment Policy will be interpreted and administered (and, as necessary, amended to be) consistent with the applicable requirements of Section 10D of the Exchange Act, as added by Section 954 of the Dodd-Frank Wall Street Reform and Consumer Protection Act, Section 304 of the Sarbanes-Oxley Act of 2002, and any official guidance issued thereunder. Pursuant to the Company’s securities trading policy, directors, executive officers and other employees are prohibited from pledging any shares of stock or engaging in any hedging transactions involving or referencing Company securities. In general, Code Section 162(m) limits the amount that we may deduct from our Federal income taxes for remuneration paid to our “covered employees” (as defined by Section 162(m), generally, our current and former named executive officers) up to $1 million per covered employee per year. Prior to the enactment of the Tax Cuts and Jobs Act, Section 162(m) provided an exception from this deduction limitation for certain forms of “performance-based compensation” that includes the gain recognized by named executive officers upon the exercise of compensatory stock options and on the vesting of performance share awards. Due to the enactment of the Tax Cuts and Jobs Act, the performance-based compensation exception no longer applies to taxable periods beginning after December 31, 2017, unless the compensation meets certain transition relief for remuneration provided pursuant to a written binding contract in effect on November 2, 2017, commonly referred to as grandfathered amounts. In the past, our Compensation Committee generally sought to structure performance-based compensation for our covered employees, and to undertake the required ministerial actions, in a manner that complies with Section 162(m) in order to provide for the deductibility of such compensation to the extent possible. Our Compensation Committee generally will continue to emphasize performance-based compensation, even though it may no longer be deductible. The Compensation Committee expects in the future to authorize compensation in excess of $1 million to named executive officers that will not be deductible under Section 162(m) when it believes doing so is in the best interests of the Company and our stockholders. Our Compensation Committee will endeavor to maintain the deductibility of grandfathered amounts going forward, except where it determines in its business judgment (as done from time to time in the past) that it is in our best interest to provide for compensation that may not be fully deductible. Because of ambiguities and uncertainties as to the application and interpretation of Section 162(m) and the guidance issued thereunder, including the uncertain scope of the transition relief for grandfathered amounts, no assurance can be given that compensation intended to satisfy the requirements for exception from the Section 162(m) deduction limit in fact will satisfy the exception. We do not maintain any arrangements that would provide any of our named executive officers any “gross-up” or other reimbursement payment for any tax liability thatsuch individual might owe as a result of the application of Sections 280G, 4999, or 409A of the Code. Sections 280G and 4999 of the Code provide that executive officers,certain highly compensated employees, directors who hold significant equity interests and certain other service providers may be subject to an excise tax if they receivepayments or benefits in connection with a change in control that exceeds certain prescribed limits, and that we, or a successor, may forfeit a deduction on the amountssubject to this additional tax. Section 409A of the Code also imposes additional significant taxes on the individual in the event that an executive officer, director or otherservice provider receives “deferred compensation” that does not meet the requirements of Section 409A of the Code. The following summary compensation table sets forth the total compensation paid or accrued for the years ended December 31, 2018, 2017 and 2016 to our named executive officers. Mr. Taylor was not a named executive officer in 2016 or 2017, and accordingly, only his compensation for 2018 is reported. Includes restricted stock and performance share awards based on the grant date fair value of such awards as calculated under Financial Accounting Standards Board (“FASB”) Accounting Standard Codification (“ASC”) Topic 718. Assumptions in the valuation of the performance share awards can be found in Note 16 to the Company’s consolidated financial statements in the Annual Report on Form 10-K filed for the fiscal year ended December 31, 2018. The following table shows the grant date fair values of these awards (for performance shares, based on the probable outcome of the performance conditions as of the grant date) and the fair value of the performance share awards if the highest level of performance conditions will be achieved. Represents the grant date fair value of options as calculated under FASB ASC Topic 718. Assumptions in the valuation of the options can be found in Note 16 to the Company’s consolidated financial statements in the Annual Report on Form 10-K filed for the fiscal year ended December 31, 2018. For additional information, see the “Compensation Discussion and Analysis—Annual Cash Bonuses” section of this proxy statement. The 2018 bonuses were paid on March 14, 2019. The dollar amounts include the following amounts and items. John J. Wasz: Company-paid matches under our 401(k) plan, which covers all employees, of $8,400 and Company-paid non-elective contribution into the 401(k) Plan of $20,625. Christopher J. Kodosky: Company-paid matches under our 401(k) Plan of $8,486 and Company-paid non-elective contribution into the 401(k) Plan of $20,625. William G. Toler: Company-paid matches under our 401(k) Plan of $8,400 and Company-paid non-elective contribution into the 401(k) Plan of $20,625. Dale R. Taylor: Company-paid matches under our 401(k) Plan of $8,400 and Company-paid non-elective contribution into the 401(k) Plan of $20,625. Devin K. Denner: Company-paid matches under our 401(k) plan of $5,102 and Company-paid non-elective contribution into the Retirement Savings Plan of $20,625. The following Grants of Plan-Based Awards table provides information concerning awards granted in Fiscal Year 2017 to our named executive officers. Represents possible cash awards for 2018 under the annual bonus plan. For additional information, see the “Compensation Discussion and Analysis—Annual Cash Bonuses” section of this proxy statement. The amounts listed under the “Target” column represent the cash awards payable for 2018 assuming 100% achievement of all goals. The amounts listed under the “Maximum” column represent the maximum cash awards payable, which for each named executive officer equal two times target bonus. Actual cash awards paid to the named executive officers for 2018 are reported in the Summary Compensation Table under the “Non-Equity Incentive Plan Compensation” column. Terms of the grants of restricted stock, performance shares and options are described below in the footnotes to the “Outstanding Equity Award Table.” The annual equity incentive plan does not have threshold awards because the awards may be paid out anywhere from 0% to 200% of the total potential amount. Mr. Wasz has an employment agreement with the Company. Messrs. Kodosky, Denner, Toler and Taylor are each party to a severance protection agreement. For a description of severance payments and benefits made available under the employment arrangements in effect as of December 31, 2018, see “Potential Payments upon Termination or Change in Control”. These amounts represent nonqualified stock options, restricted stock, and performance shares granted to our named executive officers under the Omnibus Plan. The nonqualified stock options were granted on April 3, 2014, February 12, 2015, February 11, 2016 (May 26, 2016 under ASC Topic 718), July 5, 2016, and February 9, 2017. The options and restricted stock awards have and shall become vested and exercisable with respect to 1/3 of the shares on each of the first three anniversaries of the grant date, except for those granted on February 11, 2016 (May 26, 2016 under ASC Topic 718), which have a vesting start date of February 11, 2016. Performance shares were granted on February 11, 2016, with 1/2 of the shares being vested based on the performance period ending December 31, 2017 if such performance criteria are satisfied. The remaining 1/2 of the shares vest one (1) year after such determination of the performance criteria is made if the executive remains employed through that date. On March 7, 2018, the Compensation Committee certified that the performance criteria for the performance shares granted February 11, 2016, were satisfied at the 150% level. Performance shares were granted on February 9, 2017, with 1/2 of the shares vesting based on the performance period ending December 31, 2018 if such performance criteria are satisfied. The remaining 1/2 of the shares vest one (1) year after such determination of the performance criteria is made if the executive remains employed through that date. Performance shares were granted on February 9, 2018, with 1/2 of the shares vesting based on the performance period ending December 31, 2019 if such performance criteria are satisfied. The remaining 1/2 of the shares vest one (1) year after such determination of the performance criteria is made if the executive remains employed through that date. This amount represents the value of restricted stock and performance shares using the closing price of Company stock on December 31, 2018 (the last trading day of the fiscal year), which was $25.15. Based on performance through December 31, 2018, amounts of equity incentive plan awards (performance shares) are reported at their maximum levels. This amount represents the value of the amount realized upon exercise of an option, which is equal to the aggregate difference between the closing price of Company stock on the exercise date and the exercise price of the options. This amount represents the vested number of restricted stock and performance shares. This amount represents the value of the vested shares using the closing price of Company stock on the applicable date vested. We do not offer any defined benefit pension plans. We do not offer any nonqualified deferred compensation plans. Mr. Wasz, our President, Chief Executive Officer and Chief Operating Officer, is party to an employment agreement, dated as of May 8, 2014. Mr. Wasz’s employment agreement provides him with severance benefits upon certain terminations of employment. Mr. Wasz’s employment can be terminated at any time and for any reason. If Mr. Wasz’s employment is terminated by us for “cause” (as defined below) then he is only entitled to receive any base salary that had been earned but not paid through the date of termination. If his employment is terminated due to his death or disability, he is entitled to (a) the base salary accrued through the date of termination, (b) pay for any vacation time earned but not taken, (c) any earned but unpaid bonus for the year prior to termination, and (d) any business expenses incurred by him but unreimbursed on the date of termination, provided that such expenses and required substantiation and documentation thereof are submitted within thirty (30) calendar days of termination and that such expenses are reimbursable under our policy (collectively, “Final Compensation”). Mr. Wasz’s employment can be terminated by us without “cause” or by him for “good reason.” Upon such a termination, he is entitled to receive: (a) two years of base salary, (b) his target annual bonus, (c) health, dental, and life insurance coverage for a period of one year. dishonest, disloyal or illegal conduct or gross misconduct that materially and adversely affects his performance or our reputation or business (it being agreed that a petty offense or a violation of the motor vehicle code shall not constitute “cause”). Prior to the determination that “cause” has occurred with respect to any of the grounds listed above other than a conviction of or plea of nolo contendere to a felony, Mr. Wasz will have a 30-day cure period to remedy such breach, unless, in the Board’s discretion, the “cause” event is incapable of reasonably prompt cure or if the Board determines that its fiduciary duty requires such termination. a material reduction of Mr. Wasz’s base salary, annual target bonus opportunity, benefits, and annual equity incentive awards in the aggregate, excluding any reduction in Mr. Wasz’s annual equity incentive awards that (a) is applicable to all similarly situated executives or (b) is 10% or less and results from adjustments to the allocation of a fixed pool among similarly situated executives. Mr. Wasz is required to provide written notice of any event claimed to constitute “good reason” within 30 days after the initial occurrence of such event and to provide us with an opportunity to cure the applicable circumstance within 30 days following such written notice. If we fail to cure such circumstance, Mr. Wasz’s resignation for “good reason” must be tendered, if at all, within 60 days after our failure to cure. Mr. Wasz is subject to non-competition and non-solicitation covenants for 24 months post-termination, which applies to the 24-month period following his resignation. In addition, he is subject to perpetual confidentiality covenants. Mr. Kodosky, our Chief Financial Officer, is party to a severance protection agreement, dated as of July 11, 2016. Mr. Kodosky’s employment may be terminated by us at any time for any reason. If Mr. Kodosky’s employment is terminated by us without “cause” or if he resigns for “good reason,” he would be entitled to a severance payment in a cash lump sum, equal to (i) one year of base pay at the highest rate of base salary during the one-year period immediately prior to the termination and (ii) the higher of (x) the target annual bonus amount for the year preceding the termination and (y) the average annual bonus earned and paid over the three years immediately prior to his termination. Mr. Kodosky and his dependents will also be entitled to continued health and welfare participation for one year following such termination, unless he obtains coverage from a new employer and COBRA coverage at the end of such one-year period if he has not obtained new coverage. Mr. Kodosky’s severance protection agreement generally uses the same definitions of “cause” and “good reason” as Mr. Wasz’s employment agreement, except that, (i) under Mr. Kodosky’s severance protection agreement “good reason” includes any assignment of duties materially and adversely inconsistent with his position, any material reduction in his base salary, target annual cash bonus opportunity plan, benefits, and annual equity incentive awards in the aggregate, excluding any reduction in his annual equity incentive awards that (a) is applicable to all similarly situated executives or (b) is twenty percent (20%) or less and results from adjustments to the allocation of a fixed pool among similarly situated executives, any requirement that his principal place of employment is other than our principal executive office or there is a change in his principal place of employment that increases the distance between his residence as of the date of this Agreement to his principal place of employment by more than fifty (50) miles (ii) and Mr. Kodosky must give written notice of a claim for good reason within 60 days of its initial occurrence. Mr. Kodosky is subject to a non-competition covenant that extends for 12 months following his termination of employment for any reason, a non-disparagement covenant, a non-solicitation covenant that extends for 24 months following any such termination and a confidentiality covenant extending for five years following any termination of the severance protection agreement. Mr. Denner entered into a severance protection agreement with us as of July 29, 2011. Mr. Denner’s employment may be terminated by us at any time for any reason. If Mr. Denner’s employment is terminated by us without “cause” or if he resigns for “good reason,” he will be entitled to a lump sum severance payment equal to his annual base salary plus the highest of (x) his target bonus amount for the year in which the last date of employment occurs, (y) the amount of the average of his annual bonus over the three years immediately prior to the year in which the last day of employment occurs and (z) an amount set forth on an exhibit to the severance protection agreement (which is currently zero). In addition, he will be entitled to continued health and welfare participation and participation for his dependents for a one-year period, unless he obtains coverage from a new employer, and he will be entitled to COBRA coverage at the end of such one-year period if he has not obtained new coverage. Mr. Denner’s severance protection agreement generally uses the same definitions of “cause” and “good reason” as Mr. Wasz’s employment agreement, except that, under Mr. Denner’s severance protection agreement “good reason” includes any change in his title or reporting relationship that does not reasonably constitute a promotion and any assignment of duties materially and adversely inconsistent with his position, which results in a material diminution of position, authorities, duties or responsibilities. Mr. Denner is subject to a non-competition covenant which extends for 12 months following his termination of employment for any reason, a non-solicitation covenant that extends for 24 months following any such termination, and a confidentiality covenant extending for five years following any termination of the severance protection agreement. Mr. Toler entered into a severance protection agreement with us on September 9, 2013. The severance protection agreement is substantially similar to Mr. Denner’s severance protection agreement. Mr. Toler’s employment may be terminated by us at any time for any reason. If Mr. Toler’s employment is terminated by us without “cause” or if he resigns for “good reason” (each as defined below), he will be entitled to a lump sum severance payment equal to his annual base salary plus the highest of (x) his target bonus for the year preceding the termination, (y) the amount of the average of his annual bonus over the three years immediately prior to the year in which the last day of employment occurs and (z) 50% of his base salary. In addition, he will be entitled to continued health and welfare participation and participation for his dependents for a one-year period, unless he obtains coverage from a new employer, and he will be entitled to COBRA coverage at the end of such one-year period if he has not obtained new coverage. Mr. Toler’s severance protection agreement generally uses the same definitions of “cause” and “good reason” as Mr. Denner’s severance protection agreement. Mr. Toler is subject to a non-competition covenant that extends for 12 months following his termination of employment for any reason, a non-disparagement covenant, a non-solicitation covenant that extends for 24 months following any such termination and a confidentiality covenant extending for five years following any termination of the severance protection agreement. Mr. Taylor entered into a severance protection agreement with us on April 3, 2017. The severance protection agreement is substantially similar to Mr. Denner’s severance protection agreement. Mr. Taylor’s employment may be terminated by us at any time for any reason. If Mr. Taylor’s employment is terminated by us without “cause” or if he resigns for “good reason” (each as defined below), he will be entitled to a lump sum severance payment equal to his annual base salary plus the highest of (x) his target bonus for the year preceding the termination, (y) the amount of the average of his annual bonus over the three years immediately prior to the year in which the last day of employment occurs and (z) 50% of his base salary. In addition, he will be entitled to continued health and welfare participation and participation for his dependents for a one-year period, unless he obtains coverage from a new employer, and he will be entitled to COBRA coverage at the end of such one-year period if he has not obtained new coverage. Mr. Taylor’s severance protection agreement generally uses the same definitions of “cause” and “good reason” as Mr. Denner’s severance protection agreement. Mr. Taylor is subject to a non-competition covenant that extends for 12 months following his termination of employment for any reason, a non-disparagement covenant, a non-solicitation covenant that extends for 24 months following any such termination and a confidentiality covenant extending for five years following any termination of the severance protection agreement. The following table summarizes the preceding discussion regarding additional unearned potential payments and benefits payable to each of our named executive officers assuming termination occurred on December 31, 2018. We do not provide enhanced severance payments or benefits solely upon a change of control. No payments or benefits are triggered by a change in control alone. If a named executive officer’s employment is terminated by us without “cause” or if the named executive officer terminates employment for “good reason,” in each case after a change in control, all unvested options and restricted stock will become vested and (i) for the 2018 performance share awards, we have reflected the maximum potential payment assuming 200% payout paid out in full; (ii) for the 2017 performance share awards, we have reflected payout based on actual performance, which was 50% of target, paid in full; and (iii) for the 2016 performance share awards, we have reflected payout of the remaining balance of shares (which were paid out on March 7, 2019). If a named executive officer’s employment is terminated by us without “cause” or the named executive officer terminates employment for “good reason,” the following details the cash severance each respective named executive officer is entitled to: (i) for Mr. Wasz, the cash severance is equal to two times his base salary of $875,000 plus his prior year target bonus of $825,000; (ii) for Mr. Kodosky, the cash severance is equal to his base salary of $405,000 plus the annual target bonus, which is $243,000; (iii) for Mr. Toler, the cash severance is equal to his base salary of $396,500 plus the average of his bonuses in 2015-2017, which is $326,343; (iv) for Mr. Taylor, the cash severance is equal to his base salary of $335,000 plus the average of his bonuses in 2015-2017, which is $191,550; and (v) for Mr. Denner, the cash severance is equal to his base salary of $380,000 plus the average of his bonuses in 2015-2017, which is $259,829. If either of Mr. Toler or Denner terminated employment due to retirement as of December 31, 2018, all unvested options and restricted stock will become vested. Additionally, (i) for the 2018 performance share awards, we have reflected the maximum potential payment assuming 200% payout paid out in full; (ii) for the 2017 performance share awards, we have reflected payout based on actual performance, which was 50% of target, paid in full; and (iii) for the 2016 performance share awards, we have reflected payout of the remaining balance of shares (which were paid out on March 7, 2019). If any of Messrs. Wasz, Kodosky, Toler, Denner or Taylor died or became disabled all unvested options and restricted stock will become vested. Additionally, (i) for the 2018 performance share awards, we have reflected the maximum potential payment assuming 200% payout paid out in full; (ii) for the 2017 performance share awards, we have reflected payout based on actual performance, which was 50% of target, paid in full; and (iii) for the 2016 performance share awards, we have reflected payout of the remaining balance of shares (which were paid out on March 7, 2019). The following table provides information as of December 31, 2018 regarding the number of shares of Global Brass and Copper Holdings, Inc. common stock that may be issued under Global Brass and Copper Holdings, Inc.’s equity compensation plans. Consists of the Omnibus Plan. Total number of securities to be issued consists of 428,383 outstanding non-qualified stock options, 263,499 outstanding non-vested performance shares, 150,478 non-vested restricted shares and 26,080 shares of outstanding restricted stock awards that vested, but remain restricted until a future date. The weighted-average exercise price relates solely to 428,383 outstanding non-qualified stock options. The total amount reported consists of shares available for future issuance under the Omnibus Plan, which may be issued in the form of stock options, stock appreciation rights, restricted stock, restricted stock units, deferred stock units, performance stock and performance stock units. the compensation committee of another entity in which one of the executive officers of such entity served as a member of our Board. The information contained in this Report shall not be deemed to be “soliciting material” or to be “filed” with the SEC or subject to Regulation 14A or 14C other than as set forth in Item 407 of Regulation S-K, or subject to the liabilities of Section 18 of the Exchange Act, except to the extent that we specifically request that the information contained in this Report be treated as soliciting material, nor shall such information be incorporated by reference into any past or future filing under the Securities Act of 1933, as amended (the “Securities Act”), or the Exchange Act, except to the extent that we specifically incorporate it by reference in such filing. The Compensation Committee of the Board has reviewed and discussed the Compensation Discussion and Analysis required by Item 402(b) of Regulation S-K with management and, based on such review and discussions, the Compensation Committee recommended to the Board that the Compensation Discussion and Analysis be included in this proxy statement and the Annual Report on Form 10-K for the year ended December 31, 2018. This Report is submitted by Ms. Avril and Messrs. Marsh, Ray, Welch and Whitaker, being all of the current members of the Compensation Committee. The Audit Committee of the Board is responsible for evaluating audit performance, appointing, compensating, retaining and overseeing the work of our independent registered public accounting firm and evaluating policies and procedures relating to internal accounting functions and controls. The Audit Committee is currently comprised of Ms. Avril and Messrs. Marsh, Ray, Welch and Whitaker, each a non-employee and independent director, and operates under a written charter. The Audit Committee members are neither professional accountants nor auditors, and their functions are not intended to duplicate or to certify the activities of management and the independent auditor, nor can the Audit Committee certify that the independent auditor is “independent” under applicable rules. The Audit Committee serves a board-level oversight role in which it provides advice, counsel and direction to management and the auditors on the basis of the information it receives, discussions with management and the auditors and the experience of the Audit Committee’s members in business, financial and accounting matters. Our management has the primary responsibility for the financial statements and reporting process, including our systems of internal controls. In fulfilling its oversight responsibilities, the Audit Committee reviewed and discussed with management the audited consolidated financial statements included in the Annual Report on Form 10-K for the fiscal year ended December 31, 2018, as well as the report of management and the opinion thereon of PricewaterhouseCoopers LLP, the Company’s independent registered public accounting firm, for the year ended December 31, 2018, regarding the Company’s internal control over financial reporting required by Section 404 of the Sarbanes-Oxley Act. The Audit Committee has discussed with PricewaterhouseCoopers LLP, our independent registered public accounting firm, the matters required to be discussed under the Public Company Accounting Oversight Board standards (“PCAOB”). The Audit Committee has also received written disclosures and the letter from PricewaterhouseCoopers LLP required by applicable requirements of the PCAOB regarding PricewaterhouseCoopers LLP’s communications with the Audit Committee concerning independence and has discussed with PricewaterhouseCoopers LLP its independence from the Company. Based on the review and discussions referred to above, the Audit Committee recommended to the Board that the Company’s audited consolidated financial statements be included in the Company’s Annual Report on Form 10-K for the fiscal year ended December 31, 2018, filed with the SEC on February 28, 2019. The information contained in this Report shall not be deemed to be “soliciting material” or to be “filed” with the SEC or subject to Regulation 14A or 14C, other than as set forth in Item 407 of Regulation S-K, or subject to the liabilities of Section 18 of the Exchange Act, except to the extent that we specifically request that the information contained in this Report be treated as soliciting material, nor shall such information be incorporated by reference into any past or future filing under the Securities Act or the Exchange Act, except to the extent that we specifically incorporate it by reference in such filing. This Report is submitted by Ms. Avril and Messrs. Marsh, Ray, Welch and Whitaker, being all of the members of the Audit Committee. As required by the SEC, we are providing the following information regarding the relationship of our median employee’s annual total compensation compared to the annual total compensation of Mr. Wasz, our Chief Executive Officer. In accordance with Instruction 2 to Item 402(u) of Regulation S-K, to calculate our 2018 pay ratio, we elected to utilize the same median employee that we had identified in 2017, because during 2018 there was no change in our employee population or employee compensation arrangements that we reasonably believe would result in a significant change to our pay ratio disclosure. The process that we used to determine our median employee in 2017 is summarized in the paragraph below. We selected December 31, 2017 as the date on which to determine the median employee. As of that date, we had approximately 1,980 employees (1,899 in the United States and Puerto Rico and 81 outside of the United States). For purposes of identifying the median employee, we used 2017 taxable year-to-date compensation as our consistently applied compensation measure. To identify the median employee, we excluded 81 non-U.S. employees from the following jurisdictions: 33 from the Republic of China, 41 from Mexico and 7 from Singapore. After applying this exemption, we analyzed a total of 1,899 employees to determine the median employee. In determining the annual total compensation of the median employee and our Chief Executive Officer, we calculated their compensation in accordance with Item 402(c)(2)(x) of Regulation S-K as required by the SEC. This calculation is the same calculation used to determine annual total compensation reported above in the Summary Compensation Table for our Chief Executive Officer. We believe that the pay ratio disclosed below is a reasonable estimate calculated in a manner consistent with the applicable SEC disclosure rules. This above information is being provided solely for compliance purposes. Because our Compensation Committee has determined that the ratio is not an adequate indicator of linking pay with performance, our Compensation Committee does not materially consider this ratio when evaluating compensation arrangements. In addition to retaining PricewaterhouseCoopers LLP to audit our consolidated financial statements for 2018, we retained PricewaterhouseCoopers LLP, as well as other accounting firms, to provide tax and other advisory services in 2018. We understand the need for PricewaterhouseCoopers LLP to maintain objectivity and independence in its audit of our consolidated financial statements. In order to assure that the provision of audit and permitted non-audit services provided by PricewaterhouseCoopers LLP, our independent registered public accounting firm, does not impair its independence, the Audit Committee is required to pre-approve the audit and permitted non-audit services to be performed by PricewaterhouseCoopers LLP, other than de minimis services that satisfy the requirements pertaining to de minimis exceptions for non-audit services described in Section 10A of the Exchange Act. The Audit Committee has adopted policies and procedures for pre-approving all audit and permitted non-audit work performed by PricewaterhouseCoopers LLP. Any pre-approval must also set forth in detail the particular service or category of services approved and is generally subject to a specific cost limit. All of the fees for audit, audit-related, tax and other services performed by PricewaterhouseCoopers LLP were pre-approved by the Audit Committee in accordance with the pre-approval policies and procedures described in this paragraph. The Audit Committee has adopted policies regarding our ability to hire employees, former employees and certain relatives of employees of the Company’s independent registered public accounting firm. Audit fees consist of fees incurred for the audit of our annual consolidated financial statements and review of our quarterly consolidated financial statements that are normally provided by PricewaterhouseCoopers LLP in connection with consents and reviewing documents to be filed with the SEC. Audit-related fees consist of fees incurred for assurance and related services that are reasonably related to the performance of the audit or review of our financial statements and are not reported under “Audit Fees” and fees billed for professional services provided in connection with the new accounting pronouncements. (4) All other fees consist of fees related to access to on-line software tools. We maintain and enforce a Related Person Transaction Policy, which sets forth our policy with respect to the review, approval, ratification and disclosure of all related person transactions by our Audit Committee. In accordance with our Related Person Transaction Policy, our Audit Committee has overall responsibility for the implementation and compliance with this policy. For the purposes of our Related Person Transaction Policy, a “related person transaction” is a transaction, arrangement or relationship (or any series of similar transactions, arrangements or relationships) in which we were, are or will be a participant and in which any related person (as defined in our Related Person Transaction Policy) had, has or will have a direct or indirect material interest in excess of $120,000. A “related person transaction” does not include any employment relationship or transaction involving an executive officer and any related compensation resulting solely from that employment relationship which has been reviewed and approved by the Board or Compensation Committee. Our Related Person Transaction Policy requires that notice of a proposed related person transaction be provided to our legal department prior to entering into such transaction. If our legal department determines that such transaction is a related person transaction, the proposed transaction will be submitted to our Audit Committee for consideration at its next meeting. Under our Related Person Transaction Policy, our Audit Committee will only be permitted to approve those related person transactions that are in, or not inconsistent with, our best interests. In the event we become aware of a related person transaction that has not been previously reviewed, approved or ratified under our Related Person Transaction Policy and that is ongoing or is completed, the transaction will be submitted to the Audit Committee so that it may determine whether to ratify, rescind or terminate the related person transaction. Our Related Person Transaction Policy also provides that the Audit Committee will review certain previously approved or ratified related person transactions that are ongoing to determine whether the related person transaction remains in our best interests and the best interests of our stockholders. In addition, our Code of Business Conduct and Ethics prohibits activities that conflict with, or have the appearance of conflicting with, the best interests of the Company and its stockholders. Such conflicts of interest may arise when an employee, or a member of the employee’s family, receives improper personal benefits as a result of such individual’s position in the Company. There were no related party transactions in 2018. Our Audit Committee has appointed PricewaterhouseCoopers LLP as our independent registered public accounting firm for the year ending December 31, 2019. A proposal will be presented at the Annual Meeting to ratify this appointment. Ratification of the appointment of our independent registered public accounting firm requires the affirmative vote of the majority of shares present in person or represented by proxy at the Annual Meeting and entitled to vote. If the stockholders fail to ratify such selection, another independent registered public accounting firm will be considered by our Audit Committee, but the Audit Committee may nonetheless choose to engage PricewaterhouseCoopers LLP. Even if the appointment of PricewaterhouseCoopers LLP is ratified, the Audit Committee in its discretion may select a different independent registered public accounting firm at any time during the year if it determines that such a change would be in the best interests of the Company and its stockholders. We have been advised that a representative of PricewaterhouseCoopers LLP will be present at the Annual Meeting and will be available to respond to appropriate questions and, if such person chooses to do so, make a statement. OUR INDEPENDENT REGISTERED PUBLIC ACCOUNTING FIRM FOR 2019. PROXIES SOLICITED BY THE BOARD WILL BE VOTED FOR THE PROPOSAL UNLESS STOCKHOLDERS SPECIFY A CONTRARY VOTE. Pursuant to Section 14A of the Exchange Act, we are seeking the advisory approval by stockholders of the compensation of our named executive officers, as disclosed in this proxy statement. While this vote is advisory, and not binding on the Board, it will provide information to the Board and Compensation Committee regarding investor sentiment about our executive compensation programs and practices, which the Compensation Committee will carefully review when evaluating our executive compensation program. In 2014, our stockholders approved a non-binding resolution to require an advisory vote on the compensation of our named executive officers every year, and accordingly, we have elected to provide this vote annually. The Company is committed to maintaining executive compensation programs and practices that are aligned with the Company’s business strategy. We urge our stockholders to read the “Compensation Discussion and Analysis” section above, which describes in detail how our executive compensation program and practices operate and are designed to achieve our compensation objectives, as well as the accompanying compensation tables, which provide detailed information on the compensation of our named executive officers. The affirmative vote of a majority of the shares of common stock present in person or represented by proxy and entitled to be voted on the proposal at the Annual Meeting is required for approval of this advisory resolution. THE BOARD RECOMMENDS A VOTE “FOR” THE APPROVAL OF THE COMPENSATION OF OUR NAMED EXECUTIVE OFFICERS, AS SET FORTH IN THIS PROXY STATEMENT. PROXIES SOLICITED BY THE BOARD WILL BE VOTED FOR THE APPROVAL OF THE COMPENSATION OF OUR NAMED EXECUTIVE OFFICERS AS SET FORTH IN THIS PROXY STATEMENT UNLESS STOCKHOLDERS SPECIFY A CONTRARY VOTE. Stockholders who intend to present proposals at the Company’s annual meeting of stockholders in 2020 pursuant to Rule 14a-8 under the Exchange Act must send notice of their proposal to us so that we receive it no later than November 30, 2019. Stockholders who intend to present proposals at the annual meeting of stockholders in 2020 other than pursuant to Rule 14a-8 must comply with the notice provisions in our Bylaws. The notice provisions in our Bylaws require that, for a proposal to be properly brought before the annual meeting of stockholders in 2020, proper notice of the proposal be received by us not less than 90 days nor more than 120 days prior to the first anniversary of the preceding year’s annual meeting; provided, however that in the event next year’s annual meeting is more than 30 days before or less than 70 days after such anniversary date, notice must be delivered not less than the later of 90 days prior to next year’s annual meeting or the 10th day following the day the Company first publicly announces next year’s annual meeting date. Stockholder proposals should be addressed to Global Brass and Copper Holdings, Inc., 475 N. Martingale Road Suite 1050, Schaumburg, Illinois 60173, Attention: Anne-Marie W. D’Angelo, General Counsel and Corporate Secretary. We know of no other matters to be submitted to the stockholders at the Annual Meeting. If any other matters properly come before the Annual Meeting, persons named in the proxy intend to vote the shares they represent in accordance with their own judgments. Upon written request by any stockholder entitled to vote at the Annual Meeting, we will promptly furnish, without charge, a copy of the Annual Report on Form 10-K for the fiscal year ended December 31, 2018 which we filed with the SEC, including the financial statements and schedule. If the person requesting the report was not a stockholder of record on March 25, 2019, the request must contain a good faith representation that he or she was a beneficial owner of our common stock at the close of business on that date. Requests should be addressed to Global Brass and Copper Holdings, Inc., 475 N. Martingale Road Suite 1050, Schaumburg, Illinois 60173, Attention: Anne-Marie W. D’Angelo, General Counsel. YOUR VOTE IS IMPORTANT. WE URGE YOU TO VOTE TODAY BY TELEPHONE, VIA THE INTERNET OR BY SIGNING AND RETURNING A PROXY CARD BY MAIL. Use the Internet to transmit your voting instructions and for electronic delivery of information up until 10:59 p.m. (Central Time) on May 22, 2019. Have your proxy card in hand when you access the web site and follow the instructions to obtain your records and to create an electronic voting instruction form. Use any touch-tone telephone to transmit your voting instructions up until 10:59 p.m. (Central Time) on May 22, 2019. Have your proxy card in hand when you call and then follow the instructions. Ratify the appointment of PricewaterhouseCoopers LLP as our independent registered public accounting firm for 2019. Approve, on an advisory basis, the compensation of the Company’s named executive officers. The undersigned hereby appoints John J. Wasz and Christopher J. Kodosky, and each of them, with power to act without the other and with power of substitution, as proxies and attorneys-in-fact and hereby authorizes them to represent and vote, as provided on the other side, all the shares of Global Brass and Copper Holdings, Inc. Common Stock which the undersigned is entitled to vote and, in their discretion, to vote upon such other business as may properly come before the Annual Meeting of Stockholders of the Company to be held on May 23, 2019 or any adjournment thereof, with all powers which the undersigned would possess if present at the Meeting. THIS PROXY CARD, WHEN PROPERLY EXECUTED, WILL BE VOTED IN THE MANNER DIRECTED HEREIN BY THE UNDERSIGNED. IF NO DIRECTION IS MADE BUT THE CARD IS SIGNED, THIS PROXY CARD WILL BE VOTED FOR THE ELECTION OF ALL NOMINEES UNDER PROPOSAL 1, FOR PROPOSAL 2, AND FOR PROPOSAL 3, AND IN THE DISCRETION OF THE PROXIES WITH RESPECT TO SUCH OTHER BUSINESS AS MAY PROPERLY COME BEFORE THE MEETING.